How do the interconnected challenges of climate change, invasive species, and nutrient run-off impact the ecological and social health of the North American Great Lakes region? How do efforts already underway to address these challenges connect and support one another, and where might they be at cross purposes? When we look across efforts in many U.S. states and Canadian provinces by a diverse set of players, where are the gaps and missed opportunities and where is there duplication of effort? Using a systems mapping process, Climate Interactive, along with partners from the Systems Thinking Collaborative and Arabella Advisors guided a group of NGOs and foundations to think about these questions to help them understand where they can have the biggest impact on the well-being of the Great Lakes. 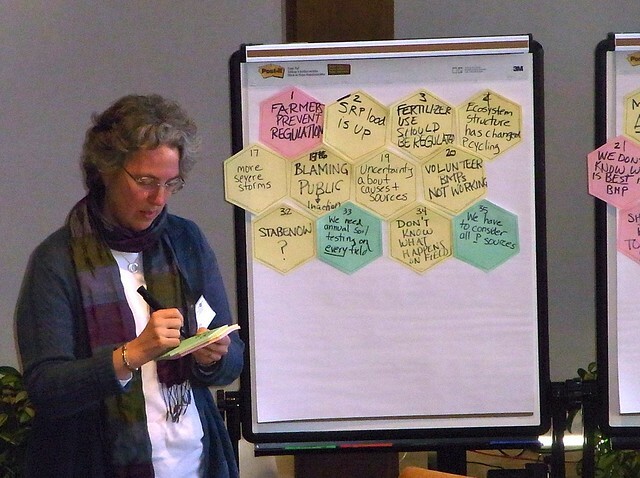 The systems mapping allowed everyone in the group to absorb a crash course in the systems ecology of the Lakes from the scientists who participated, as we began to see the ways in which invasive species change the ecology and nutrient cycling; the ways in which practices like no-till agriculture produce a temporary, but not sustained, decrease in phosphorous loading; and the ways in which future climate change could exacerbate current challenges in the lakes. The mapping also drew in socio-economic drivers, particularly those that incentivize or discourage different land and nutrient management practices. As often happens in systems mapping exercises, we found the boundaries of the system expanding through our discussions, as we realized that a more accurate map would be informed not just by scientists, NGOs, and funders, but also by listening to farmers and understanding more of the drivers of their decision-making. When we layered in the scope of current activities we saw, as again is often the case, clusters of activity, as well as areas of opportunity where less work was being done, particularly around outreach to other constituencies, from the fishing and tourism industry to the public health community; all of these groups have goals that also depend upon the health of the Great Lakes. Every systems mapping project is different, depending on the nature of the system being mapped and the interests and experiences of the gathered group, but this exercise, like many others I’ve participated in had some common themes as well. New thinking emerged, people were able to see old problems from new angles, people began to see what they didn’t know as well as what they did, and we had a host of new ideas for projects, collaborations and possibilities. Great to see Beth. Looking forward to hearing more details on our next walk.